Always on Top – When non-minimized, the KillSwitch window is always visible ahead of any other applications. Other applications will appear in the background. 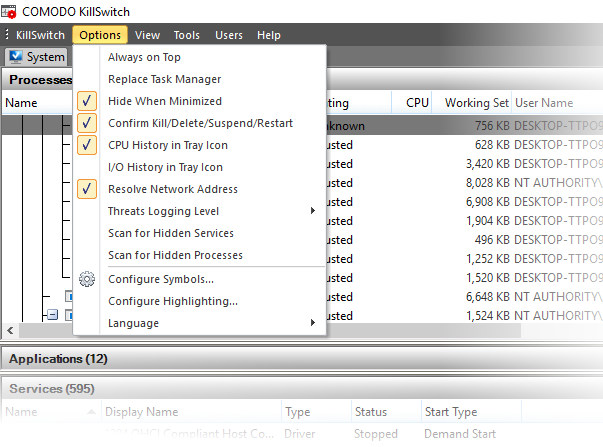 Hide When Minimized - KillSwitch automatically hides itself when it is minimized. You can double-click on the system tray icon to reopen the application. CPU History in Tray Icon – A KillSwitch icon is shown in the system tray at the bottom-right corner of the screen.The icon provides a fast way to open or close the application, shutdown your system and so on. See 'The System Tray Icon' for more details. I/O History in Tray Icon – The tray icon shows graphics to represent the input/output activities of your computer. Resolve Network Address - If enabled, KillSwitch shows host names in the 'Local Address' and 'Remote Address' columns in the 'Network Connections' window. If not enabled, only the IP addresses of the local host and remote hosts are shown. Log All Events – Record every event that takes place. This produces the most comprehensive reports but at the cost of larger file sizes. 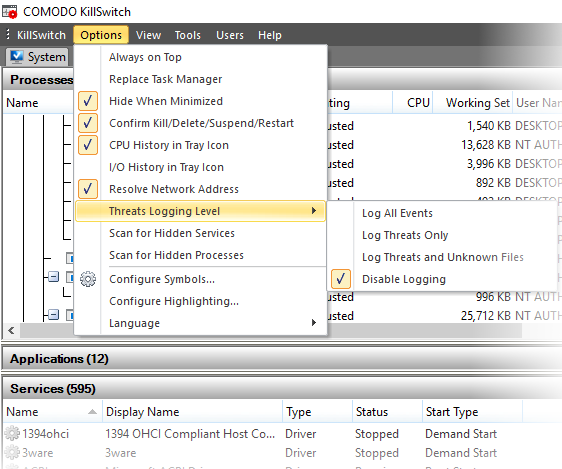 Log Threats Only	– Record only those events where KillSwitch detected a malicious process or service. Log Threats and Unknown Files - Record events which concern malicious processes, and processes for which no trust rating exists. 'Unknown' processes have not yet been tested to establish whether they are safe to run or not. Disable Logging - Do not record any events. 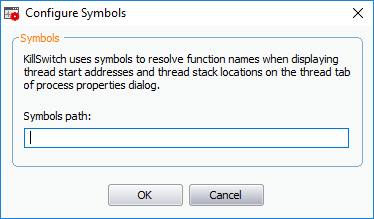 Configure Symbols – KillSwitch uses the program database symbols to resolve their function names to find the start addresses and stack locations of threads. This is displayed in the 'Threads' tab of the process in properties dialog. If you have relocated the pdb files, you can specify the new path of the file through this option. Click on the color patch beside the required parameter. 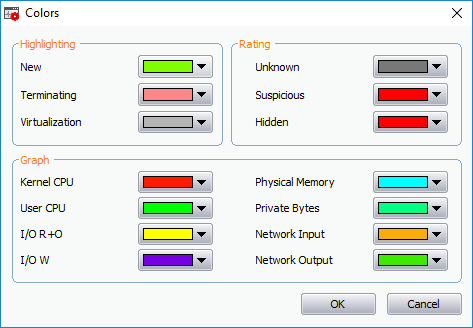 The 'Color' window opens with the default color selected. 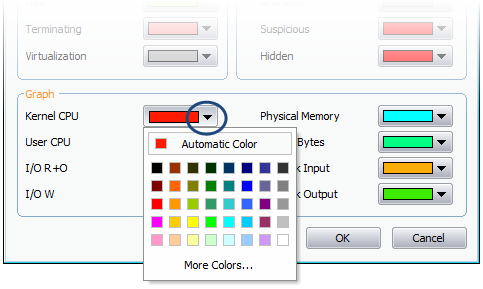 Click on 'More Colors...' to add a custom color to the palate and select it. The highlighting and/or graph lines will be displayed with the colors you have chosen. Language - KillSwitch is available in several language. Hovering the mouse cursor over 'Language' in the 'Options' menu shows the list of languages. You can select the language for application from the list.